When new transgenic lines need to be introduced into animal facilities, or when animals need to be rederived to remove specific pathogens, this Shared Resource is capable of performing a variety of techniques necessary to prevent the introduction of pathogens in the mouse facilities. This includes in vitro fertilization, rederivation and ovarian transplantation. Specific Pathogen Free animals will be generated and delivered to your facility. In vitro fertilization requires fresh or frozen sperm from a transgenic male that is used to fertilize oocytes from superovulated female mice. IVF rederivations generally produce larger numbers of pups born when compared to the thawing of one or two straws of embryos for rederivation. After incubation overnight and fertilization, two-cell embryos are transferred into recipient animals. About 19 days later, pups are born and at 3 weeks of age the Vanderbilt Genome Editing Resource staff will wean, tail, and ear punch the pups. The investigator will then screen the tail DNA for transgenic founders and notify the resource of their results. This is also a valuable service for quick expansion of a mouse colony, providing a large quantity of animals to establish a colony. For rederivations, fresh or frozen 0.5 to 3.5 day old embryos are washed numerous times in sterile medium and are then transferred into recipient females. Seventeen to nineteen days later pups are born and at 3 weeks of age the Vanderbilt Genome Editing Resource staff will wean, tail, and ear punch the pups. The investigator will then screen the tail DNA for transgenic founders and notify the resource of their results. This service is recommended for homozygous lines or lines with multiple genetic mutations. For embryo transfer, females are superovulated and bred to males. Embryos are collected the following day, washed to further reduce pathogen transfer and then surgically transferred into pseudopregnant females housed in the barrier facility. Pups will be born about 19 days later and weaned and tailed at 3 weeks of age. This service is recommended for homozygous lines or lines with multiple genetic mutations. For ovary transplantation, ovaries from a transgenic female are removed and transplanted into 1-2 recipient animals. This service, although not frequently utilized, is essential when a valuable line of animals ceases to reproduce and is at risk. DAC staff review serology results, approve movement of mice, and transfer transgenic founders to PIs mouse housing room. 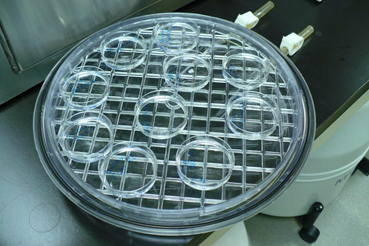 IVF dishes sitting in a modular incubator.